The causative agent of yellowhead disease is yellowhead virus (YHV), a corona-like RNA viruses in the genus Okavirus, family Ronaviridae and order Nidovirales. 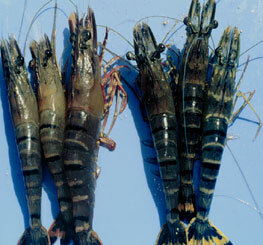 YHV is highly infectious for most known species of cultivated penaeid prawns. Until proven otherwise, it should be assumed that most penaeid prawns worldwide are susceptible to infection with yellowhead disease. Yellowhead disease has been officially reported from India, Thailand and Vietnam. The tiger prawn suffers acute epidemics, with mortality reaching 100% within 3–5 days from first appearance of the gross signs. Transmission is horizontal, direct from the water column and through ingestion of infected material. Tiger prawns younger than 15 days postlarvae (PL-15) are fairly resistant to yellowhead disease compared to those from PL-20–25 to subadult, which are highly susceptible. Massive mortality usually affects early to late juvenile stages in rearing ponds. There appear to be at least four types of virus in the YHV group. Only yellowhead virus has been reported to cause yellowhead disease. Vectors may include asymptomatic carrier crustaceans. Comparison of DNA sequences of reverse-transcription polymerase chain reaction (RT PCR) products from YHV and GAV suggests that they are closely related, but distinctly different viral strains or species.